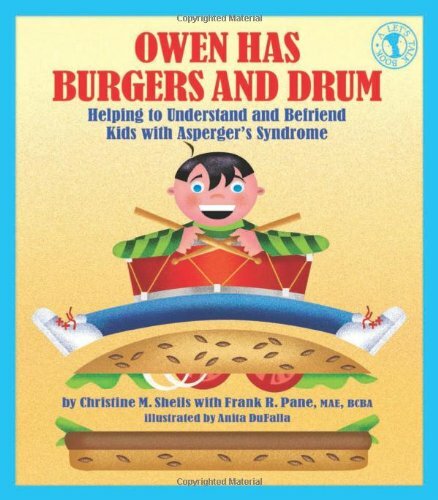 Seven year-old Cal is curious about Owen, his new neighbor and classmate, because he overheard Owen's mother telling his teacher that Owen has burgers and drum, and Cal cannot figure out if Owen wants to be friends or not because Owen speaks too loudly and tapes the rules to his desk, but Cal learns that Owen has Asperger's syndrome which gives him a different learning style but does not prevent him from being a good friend. At the end of the book, the authors provide tips and suggestions to help parents and educators talk with children about Asperger's Syndrome and to help children better understand kids with an autism spectrum disorder. A Let's talk Book for use with primary age children.